The Garden Oaks Civic Club meets Tuesday December 2nd at 7:00 pm. It is a brief meeting followed by a pot-luck dinner. It is being held at a different location this year, the Garden Oaks Montessori, 901 Sue Barnett. 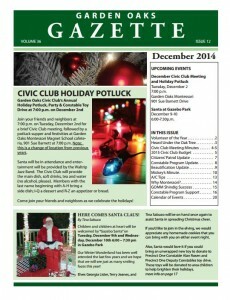 Details are in the Garden Oaks Gazette, attached.